It’s rigorous: It has an internally consistent structure, which efficiently decomposes the challenge of customer engagement. It’s accessible: You can understand the basics in 5 minutes (@ 250 words/min.). It’s actionable: It’s not just a cute idea, or a way to explain things after the fact. Any venture can use it to improve user revenue. Basically, Nir’s work answers the question: How do you create and increase user engagement? It’s harder and harder to rise above the noise floor and I don’t know anyone who’s not interested in better strategies. His approach marries psychology with a practical approach to user engagement. The first step is finding both external and internal Triggers to prompt the intended action. An external trigger is something the user sees- like when the personal finance site Mint.com sends me a notice that I’ve got a finance charge because I haven’t paid off my credit card. An internal trigger is something the user feels or thinks- I use Facebook when I feel lonely and want to connect with my friends. For your various personas, what are the applicable Triggers? 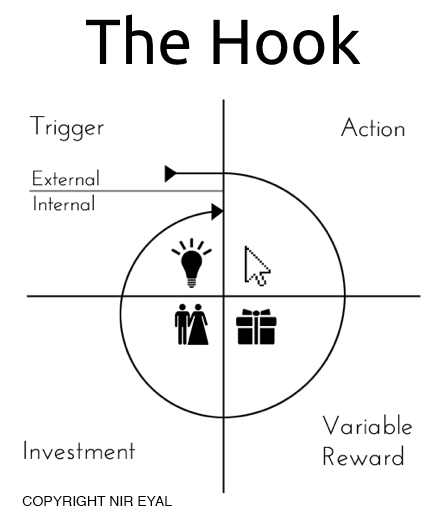 What are the external and internal triggers to use your product? How could you make them more effective? How do you know if/when they’re working? What existing triggers are common and entrenched with your various personas? What can you learn/replicate from that? The Action is the minimum interaction the user needs to have with your product to get to the Reward (something they’ll like- next item). With Google, that’s as simple as performing a search. With Facebook, it means logging into your account and scrolling through the newsfeed. As a product designer, your main goal is to make the minimum action as quick and effortless as you possibly can. Nir references the Fogg behavior model which shows an inverse relationship between motivation and ability (a proxy for difficulty). Basically, this says the harder you make your Action, the more motivation you need to manufacture. Nir also notes that most ventures underinvest in making the minimum user action easier while overinvesting in attempting to drive motivation. What is your most minimum action the user can take in anticipation of reward? Have you minimized the effort required to take the intended action? The Reward is the why, the objective for the user, emotionally speaking. It turns out that there’s a lot of tuning you can do to manufacture desire for this reward, beyond just helping the user meet their goal with the interaction. Variable rewards create a dopamine ruckus we can’t resist- think of a slot machine. Think of video games- the durability of multi-player games (vs. their more deterministic single player equivalent) is that the social interaction creates infinite variability. Rewards of ‘The Tribe’ anchor in social affirmation. When someone Likes something you posted on Facebook, that’s a Reward of the Tribe. Stack Overflow is a site where engineers answer questions for each other. Why? The site tracks peer acclimation and your status rises over time- Rewards of ‘The Hunt’ anchor in the excitement of finding something you want. Pinterest is a great example- the photos you trawl are highly variable and every so often you find a gem. Rewards of The Self have to do with competency and mastery- building up a character in a role-playing game or clearing your inbox, for example. How do you reward the user? Are the rewards of ‘The Tribe’, ‘The Hunt’ or ‘The Self’ and how can you add a multitude of various reward types? We value our own work a lot. In a 2012 experiment, researchers found that subjects valued an origami frog they created as much as one created by an origami expert. Your job as a product designer is to get the user to invest, setting themselves up for the next Trigger, storing value, and creating preference. If you have a calendar application and you have the user set a reminder, you’re setting them up for the next trigger. If I interest a visitor to this website to sign up for my email updates or Twitter feed, I’m setting them up for the next trigger. When you accumulate that great reputation on Stack Overflow (see previous), you’re storing social value, you’re invested. It’s the same when others start to follow you on Twitter, etc. Users strive to maintain consistency- among other things, it helps us validate our actions. This too is a kind of Investment. How do users load the next trigger, store value, and create preference by investing effort into your product? What opportunities are there to improve on that? Let’s pick something familiar to all of us residing on this planet- Facebook. This is a pretty easy one to map out- it’s wildly habit forming. That said, even if your product doesn’t burst with obvious habit-forming hooks, I think you’ll still find spending at least 30 minutes answering the questions from the last few sections a useful focal exercise (please consider letting me know if you agree or disagree with a comment below). External: People are talking about me! Tagging me in photos. Planning events.Internal: I’m alone, lonesome, bored. What are my friends up to? Create an account and find a few friends.Typical/Steady State: Type in the URL and space out. Post if you’re a sharer. Then check on obsessively to see if anyone Likes it! Your friend network grows- bail on Facebook and you’re ignoring your friends. It becomes part of how you and your circles meeting and create relationships. Getting Likes. Finding old friends. Getting contacted by old friends. As of June 2013, Stack Overview has 1.7MM registered users exchanging Q&A on computer programming questions. External: I already answered this question- check out my answer on stack overflow.Internal: I’m tired of what I’m doing and I want to test and improve my knowledge with some of my peers. Minimum Viable: Create an account and find a relevant topic.Typical/Steady State: Log in and post or answer a question. Your prestige grows. It becomes part of how you pick up new topics and attack non-obvious problems. Getting voted up. Finding answers to your questions. For more check out his blog and his upcoming ebook, ‘Hooked’. I’ll also be incorporating Nir’s material into the Curriculum here, the Venture Design Framework, and my structured program for new venture design, Startup Sprints.